This reviewer is a long time fan of Benoît Mandelbrot, owning a copy of The Fractal Geometry of Nature and having programmed the Mandelbrot set for computer demonstrations way back in 1980s. The Mandelbrot set has been called the most complex object in mathematics—in Dr. Mandlebrot’s own words, “Pick a constant c and let the original z be at the origin of the plane; replace z by z times z; add the constant c; repeat.” Though Dr. Mandelbrot said he didn’t invent fractals, they were always there. Benoît Mandlebrot was a pioneer in fractals, the study of familiar but dissimilar shapes as can be seen in mountains, coastlines, trees, turbulent eddies, the weather, and galaxy clusters. He devoted his scientific life to measuring roughness of geometric shapes and also to asking questions. “What shape is a cloud, a flame or a welding? How can one describe—or be able to act on—the votility of prices quoted in financial markets?” In answering these questions Dr. Mandlebrot provided significant contributions to seemingly unrelated fields. There are two kinds of fractals, those that are self-similar: shapes that scale by the same amount in every direction as seen in objects as diverse as cauliflowers and clouds. Then there are self-affine fractals: shapes that scale by different amounts in different directions as seen in weather and turbulence. Fractals are, as Dr. Mandlebrot said, “strangely appealing” to three very different groups, to those who are interested in: pictures, complexity, and pure mathematics. 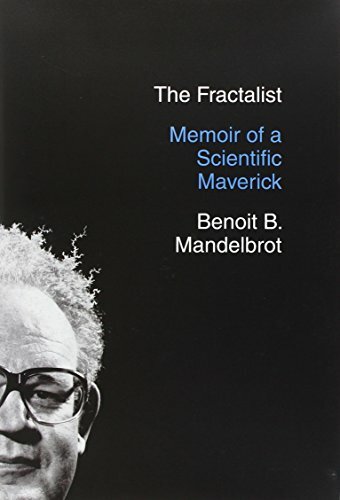 The book jacket cover photo shows Dr. Mandlebrot against a black background, his frizzy gray hair altered to form fractals. Very cool. In this memoir, Dr. Mandlebrot chooses his words carefully. Dr. Mandlebrot describes his life and times with both introspection and humor. With the text the offspring of an exacting memory The Fractalist progresses at a measured pace. The importance of Dr. Mandlebrot’s mathematics, however, takes a back seat to growing up during turbulent times in Europe and his peripatetic academic life. Dr. Mandlebrot’s family moved to Poland from Lithuania in the aftermath of WWI, and Benoît was born in Poland in 1924. A family photo shows his uncle Szolem, father and grandfather sitting with the mathematicians Jacques Hadamard and Paul Montel. Benoît Mandelbrot’s uncle Szolem was a mathematician, his father in the clothing trade, and his mother and aunt were both dentists before modern anesthetics. Dr. Mandlebrot’s childhood was during a period of social upheaval, and he had intermittent formal schooling. During the depression in Poland, the mathematician Sierpinksi invited his uncle Szolem to move to Paris. When Benoît’s father’s business failed, Szolem encouraged Benoît’s father to move as well. Benoît’s family moved to Poland in 1936 but a stable life in Paris did not last long. Benoît’s family had to leave ahead of the Germans, moving to Tulle in Vichy France in 1940. Uncle Szolem escaped with his family to America, to teach at Rice University. Vichy France provided a unique opportunity for Benoît’s schooling. “Because university careers were very rare, the kinds of people who today would supervise PhD dissertations were teaching eleven year olds.” Dr. Mandlebrot says his family’s survival as Jewish refugees was due to luck, including the actions of a clerk, a classmate’s sister, who deliberately lost their files. Their luck remained tenuous, however. In 1943 Dr. Mandlebrot’s family had to leave Tulle in fear of denunciation. For safety, his father split up the family. Benoît and his brother were apprenticed to a toolmaker but he and his brother have to move several times, in constant fear of being recognized. In a college in Lyon under an assumed name, Benoît finds his true calling as a taupin, the French word for nerd. Benoît refers to his abilities in math as a “freakish gift.” In June 1944, the college closes and students are urged to leave the city. Benoît was assigned to one neighborhood farm, then another. After Paris was liberated he rejoined his family. Back in Paris, his biggest decision was to get into the best university he can. There were two options at the time: École Polytechnique (nicknamed “Carva”) and École Normale. Admissions’ testing in 1944 showed Benoît to be the best math student in the whole of France. Choosing Normale, he attended for only one day. Not to his liking he immediately resigned and transfered to Carva. At Carva, Benoît was the school’s only foreign student and became a French citizen while attending. Carva was run like a military academy (during the time of Napoleon III, it actually was). Benoît lived in barracks and wore a military style uniform (an improvement as he entered with only rags for clothes). Uniforms came with a sword (which had to be returned on graduation), and Benoît marched with classmates in parades down the Champs-Elysées—once in honor of visiting Ho Chi Minh. Benoît was graded for military bearing as well. Many years later he read his file and found he received a 2/20 his first year. The comments of Captain Wolf indicated that 2/20 implied a willful troublemaker, but no, Benoît had no concept of military authority. Benoît’s math teachers included Gaston Julia and Paul Levy, of the Julia set and Levy process, objects that fractalists now use every day (though unknown to the world until Mandelbrot introduced them). On graduating in 1947, Benoît went to Caltech where he studied aeronautical engineering. He believed that he would be learning from the master, Theodore Von Karman but Von Karman wasn’t in California. He was on leave in Paris. As soon as Benoît got to Caltech he realized that aeronautics was not what he wanted to do with his life. “I pretty much wasted my two years at Caltech” though he added, “I am very much lucky to have gone” for the intellectual environment as well as (years later) for meeting his future wife, the second cousin of his roommate. Students at Carva automatically became civil servants with long-term legal commitment—though that commitment could be undone by repaying tuition and board, which his father did (but not quite). Back in France from Caltech, curious about his military status, he asked and found that his records indicated his stay at Caltech as only “on leave.” Benoît served the next 12 months in the air force as a reserve officer in the office of Scientific Research. But Benoît again got lucky. He was stationed in Paris, did not have to wear a uniform, and became an opera fan. Benoît entered the University of Paris. His PhD dissertation was “flawed,” joining two completely different topics and written with determination but no forethought. The dissertation committee had its own problems, with no member of the committee giving thought to the content of his thesis, yet Dr. Mandlebrot’s degree was awarded nonetheless. His dissertation’s true value was not to be known for 30 years. The dissertation’s topic is now referred to as the Mandelbrot-Zipf Law—and was just one part in the puzzle leading to fractals. Dr. Mandlebrot would have had it made for life if he stayed in France but he again traveled to the U.S. for postdoc work. First to the Research Laboratory of Electronics (RLE) at MIT, to be close to Norbert Weiner and the field of cybernetics, then to IAS, the Institute for Advanced Study at Princeton to work with John von Neumann. Dr. Mandlebrot then moved back to France in 1954 to the Paris lab of Philips, CNRS. In Paris, he wooed his wife Aliete, and together they moved to an apartment in Geneva, where Dr. Mandlebrot did statistics for Jean Piaget (the child psychologist), while waiting for a suitable academic opening. Offered a teaching position at the University of Lille with tenure, Dr. Mandlebrot instead accepted an offer to work at IBM in New York. He called the period from 1958 to 1993, the golden age of IBM. Though of this period he said, “I rarely managed to do what I was dying to do. Instead, I was doing what happened to be most desirable given what I perceived as the market for scientific ideas like mine." In his first three years at IBM he made two major discoveries. The first was the fractal nature of the variability of prices, the second the fractal nature of telephone transmission noise. Dr. Mandlebrot was also working with computer graphics before IBM became officially involved in computer graphics. Fractals are meant to be seen, and his first fractal drawings were of coastlines. “I picked them because nobody had permanent interests that would interfere with their acceptance; but also because my father was a map nut.” IBM also allowed him to leave for visiting professorships and consulting gigs. His first visiting professorship was teaching economics at Harvard—at greater pay than he was getting at IBM. That the heart of finance was a fractal was controversial and too difficult to prove in 1963. One critic of the time said that if the fractal nature of economics were valid, all economists’ statistical tools—and their work would become meaningless, with centuries of past work sent to the ash pile. Dr. Mandelbrot did not respond directly to this particular criticism except to imply that ignoring the fractal nature of economics (and instead by economists keeping faith in the Black-Scholes-Merton algorithm) played a part in the recent Wall Street meltdown. Over the years Dr. Mandlebrot gave seminars at Harvard, MIT, and Bell Labs, and also was a visiting Fellow at Isaac Newton Institute in Cambridge, England. The Mittag-Leffler Institute in Stockholm honored him by choosing several fractal related topics to work on, most recently in 2002 when the Institute sponsored a study on the mathematics of the Internet. Benoît Mandelbrot’s The Fractal Geometry of Nature was first published in 1982, making him a household name (in my household anyway) and is still in print after 30 years. The word fractal is now as familiar to the American psyche as quantum leap, turbo-charged, and gluten-free. Dr. Mandlebrot died shortly before the manuscript of The Fractalist went to the publisher. If you love fractals, you will love this memoir.